Bangalore, April 22, 2017: Writer, entrepreneur and youth expert, Rashmi Bansal launched her latest book, God’s Own Kitchen: The Inspiring Story of Akshaya Patra – a social enterprise run by monks and CEOs, at ISKCON, Rajajinagar, Bangalore on April 22, 2017. The book was launched in the auspicious presence of Shri Madhu Pandit Dasa - Chairman, The Akshaya Patra Foundation, Shri T.V. Mohandas Pai - Independent Trustee, The Akshaya Patra Foundation, Shri Chanchalapathi Dasa - Vice Chairman, The Akshaya Patra Foundation, Shri Shridhar Venkat – CEO, The Akshaya Patra Foundation and Hon’ble Justice, Shri Santosh Hegde. The Akshaya Patra foundation provides mid-day meals to 1.6 million school children every day, and this book is the exciting story of spiritualists and capitalists coming together to launch a unique start-up to make it a ‘Made in India’ success. A chance meeting with Shri Mohandas Pai inspired Shri Madhu Pandit Dasa to use the spare capacity in the ISKCON kitchen to start a mid-day meal programme for 1500 children, in and around Bangalore. 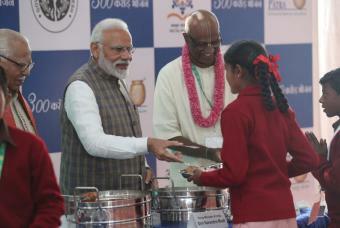 Today, Akshaya Patra is the world’s largest NGO-led Mid-Day Meal Programme, with 28 kitchens across 11 states, serving 1.6 million hot lunches to government schools each day. Shri Mohandas Pai congratulated Rashmi Bansal and the entire team of Akshaya Patra for narrating a beautifully illustrated story of the Foundation and bringing forth its spirit. Honorable Justice Shri Santosh Hegde, appreciated the work and extended his full support towards feeding children hot and nutritious meals. About Rashmi Bansal: Rashmi Bansal is a writer, entrepreneur and youth expert. She is the author of 7 bestselling books on entrepreneurship — Stay Hungry Stay Foolish, Connect the Dots, I Have a Dream, Poor Little Rich Slum, Follow Every Rainbow, Take Me Home and Arise, Awake — which have sold more than a million copies and been translated into 12 languages. Rashmi is also the founder of Bloody Good Book (www.bloodygoodbook.com), a platform to discover and e-publish budding authors. She is also a motivational speaker and mentor to students and young entrepreneurs. She is an economics graduate from Sophia College, Mumbai, and an MBA from IIM Ahmedabad. About Westland: Westland Publications Ltd. is one of the largest English language trade publishing houses in India. It has been acquired by Amazon and the company is now a wholly-owned subsidiary of Amazon Eurasia Holdings SARL. Westland’s bestselling authors include Amish Tripathi, Ashwin Sanghi, Devdutt Pattanaik, Ashok Banker, Rujuta Diwekar, Rashmi Bansal, Anita and Harsha Bhogle and Preeti Shenoy, among others. Since Nielsen has started their Bookscan in India — which tracks bestselling titles across the country — Westland has consistently had a strong presence in the top 50 bestselling charts. About Akshaya Patra: About The Akshaya Patra Foundation: The Akshaya Patra Foundation is a not-for-profit organisation headquartered in Bengaluru, India. The organisation strives to fight issues like hunger and malnutrition in India. By implementing the Mid-Day Meal Scheme in Government schools and Government aided schools, The Akshaya Patra Foundation aims not only to fight hunger but also to bring children to school. Since 2000, the organization has worked towards reaching more children with wholesome food on every single school day. Akshaya Patra Foundation is continuously leveraging technology to cater to millions of children. Its state-of-the-art kitchens have become a subject of study and they attract curious visitors from around the world. In partnership with the Government of India and various State Governments and inestimable support from many philanthropic donors and well-wishers; Akshaya Patra has grown from humble beginnings serving just 1,500 school children across 5 schools. Today, Akshaya Patra Foundation is the world’s largest (not-for-profit run) Mid-Day Meal Programme serving wholesome food to over 1.6 million children from 13,529 schools across 11 states in India.